This is the all-terrain member of the Road Venture family. 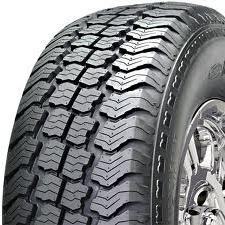 The AT's solid center rib provides greater steering stability and longer tread life. The AT's optimized groove tapers promote "self cleaning" for excellent snow and all-terrain traction. The computer designed mold profile improves durability and fuel mileage.